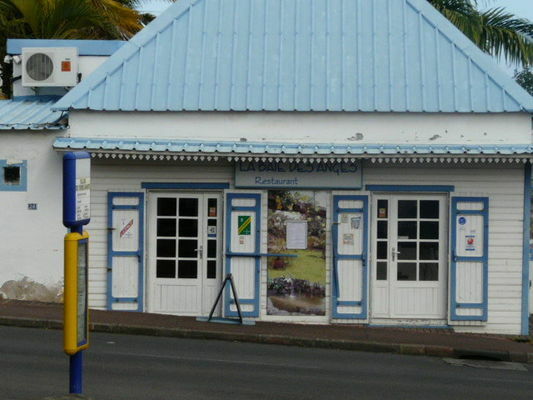 Located on the seafront of Terre Sainte, a small village near Saint-Pierre, this restaurant provides a welcome stop-off to enjoy a meal in the maritime ambience of its dining room or on its delightful tropical terrace. La Baie des Anges serves European cuisine, with a choice of meat, fish and seafood, and excellent salads. French and South African wines. Opening hours : from Monday to Wednesday, midday-2p.m & 7.15p.m-9.15p.m. Thursday, midday-2p.m. closed on the evening. Saturday closed at lunchtime and open for dinner from 7.15p.m-10p.m. Environment / Access : Take the road to Saint-Pierre and continue on to Terre Sainte and into the village centre. The restaurant is located across from the church.